We were the 3rd post to be granted a charter in the state of New Hampshire in 1919. 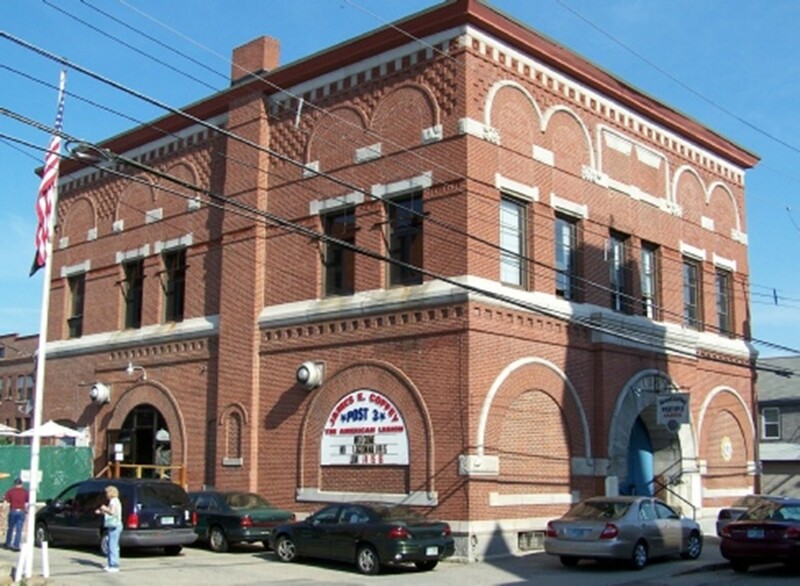 Our current post home was once the police station for the city of Nashua, NH. Memorial Day, May 30, 1919 saw a good turnout of World War 1 Veterans taking their place alongside of members of the Grand Army of the Republic and Spanish War Veterans in paying tribute to deceased veterans of all wars. When the Memorial Day parade and exercises came to an end, many of the foot weary marchers trudged off to their homes to spend a quiet afternoon. 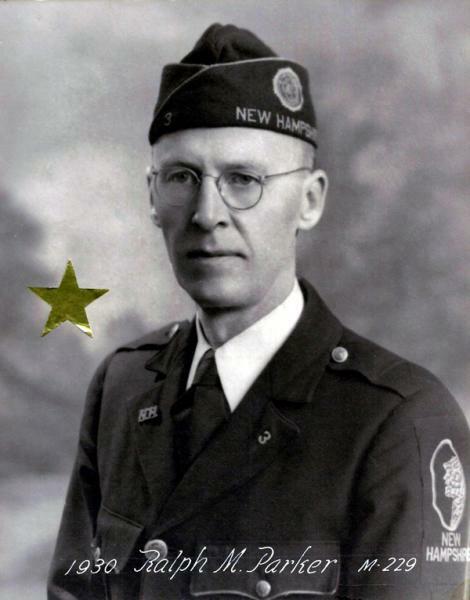 However, some twenty-five veterans of the war which..
A charter was granted by national on June 15, 1919 and the James E. Coffey Post became the third Legion Post organized in the State of N.H.. Following granting of the charter, an organization meeting was called and all the temporary officers were officially elected as the first regular officers of the Coffey Post. 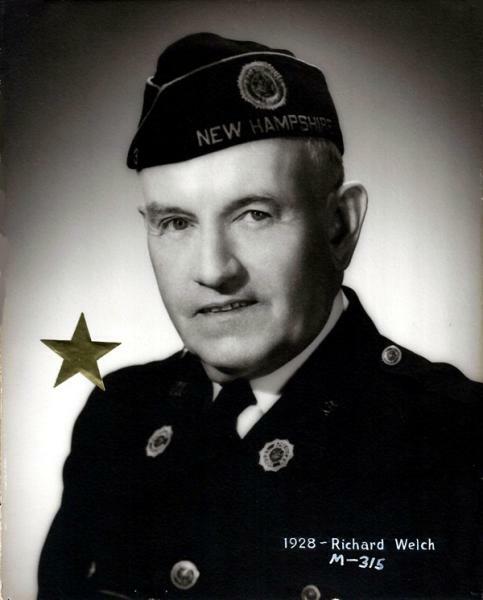 COMMANER: Colonel William E. Sullivan (pictured) VICE COMMANDER: Charles Cote FINANCE OFFICER & TREASURER: David P. Stevens RECORDING SECRETARY (Adjutant): Harry..
1919 Aug 15, Telegraph - LEGION POST SELECTS NAME OF FIRST SOLDIER KILLED IN WORLD WAR Nashua post, American Legion, No. 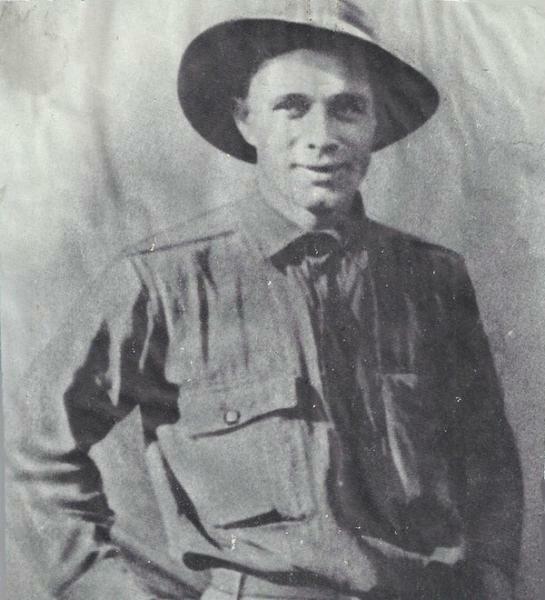 3, honored their former comrade, Private James E. Coffey (pictured), by selecting his name at last night's meeting by a unanimous vote as the name for the post. 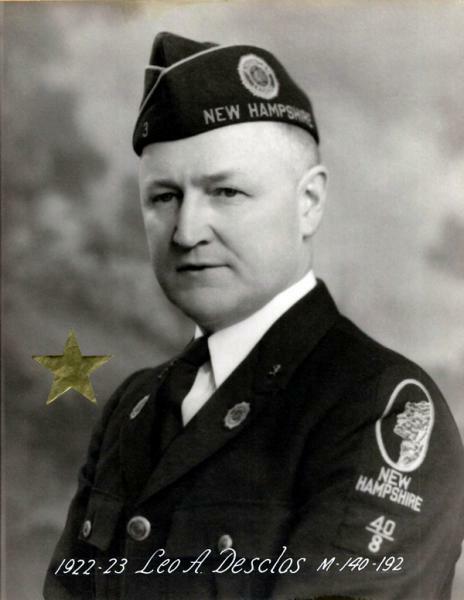 He was the first Nashua soldier to die in action and have his death officially confirmed by the War department. The names of Capt. 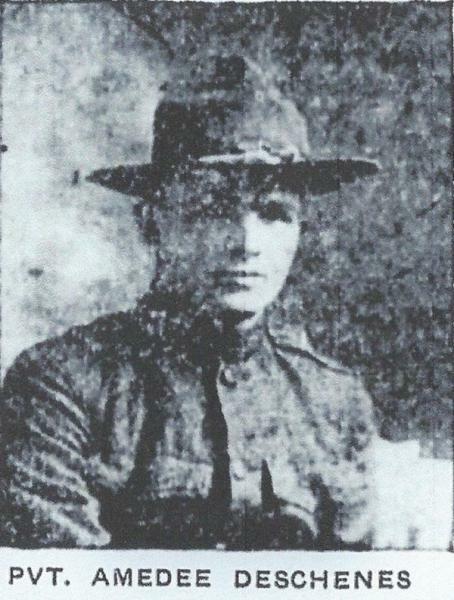 Wilkie I,..
James E. Coffey Post 3 played a significant role in the celebration of Armistice Day, Nov. 11, 1919 in Nashua. The post helped organize the Armistice Day Parade. 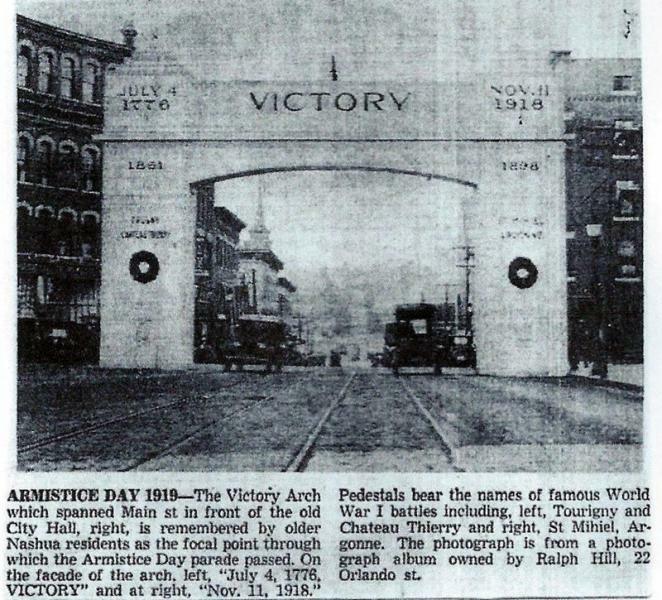 The newspaper photo shown here depicts the Victory Arch which spanned Main St. in front of the old City Hall, right, is remembered by older Nashua residents as the focal point through which the Armistice Day parade passed. On the façade of the arch, left "July 4,..
From the front page of the Nashua Telegraph dated Tuesday, November 11, 1920 DESCHENES PARK TABLET UNVEILED TODAY COMMEMORATES WAR HERO. Parade of veterans and school children precedes formal dedication exercises - Oval named for young soldier who saved the day at XIVRAY. This afternoon, the city of Nashua will pay its only official tribute to date to the memory of the heroes from this city who nobly carried Old Glory to consummate a world-wide..
From the front page of the Nashua Telegraph, Tuesday, Feb 1, 1921 A rousing housewarming and the installation of officers marked the meeting of James E. Coffey post, American Legion, as a gala night long to be remembered, The installing officer was State Commander Reginald Stevenson of Exeter and many distinguished guests were present. An entertainment and lunch followed the installation and addresses of a number of guests. Mayor Henri A. Burque was present as.. Commander: Leo A. Desclos (pictured) Vice Commander: Eugene Ackley Adjutant: Earl W. Pratt Finance Officer: George Haggerty Treasurer: Dr. A. E. Brownrigg Historian: David P. Stevens Sgt. 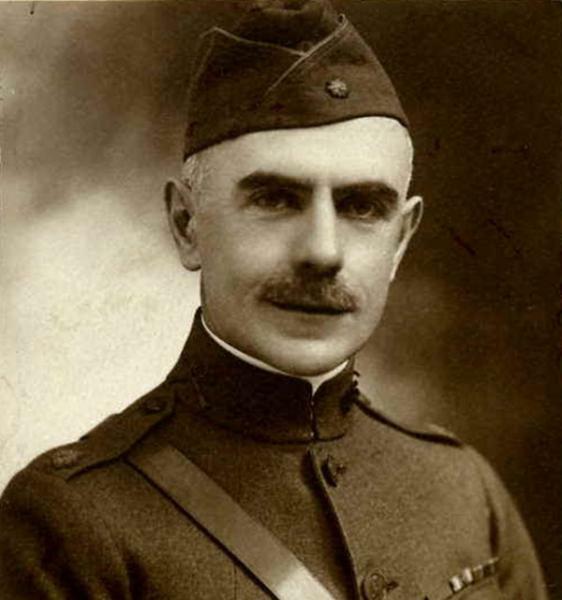 at Arms: Arthur O'Neil Commander Leo A. Desclos served two terms a commander, serving from Nov 1921 to Nov 1923. The Coffey Post secured quarters in the old Sargent building at this time, and after extensive repairs by members, had a permanent meeting place. Many social times were.. The Department of New Hampshire State Convention was held at the Weirs August 14, 15, 16, 1923. William E. Sullivan (pictured), the first Commander and one of the organizers of James E. Coffey Post 3, was elected N.H. Department Commander at that convention. 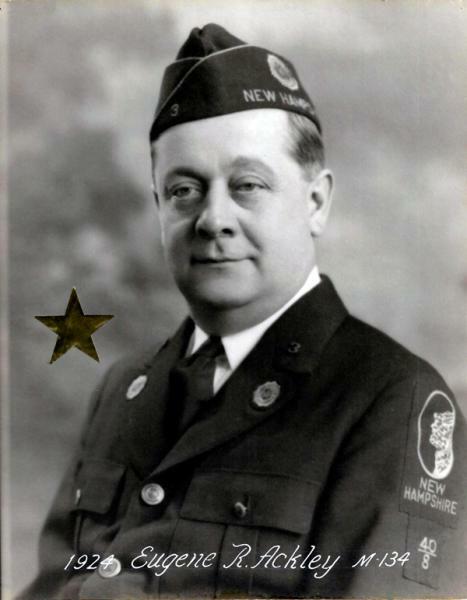 He was the first Coffey Post member to serve as N.H. Department Commander and led the N.H. delegation to the National Convention in San Francisco, CA in Oct. 1923. 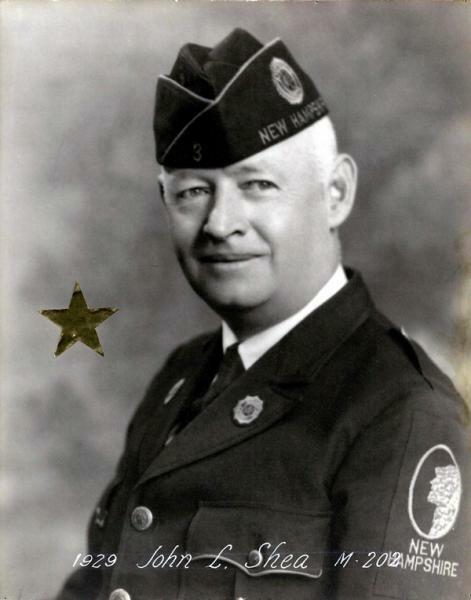 He was among..
Eugene R. Ackley (pictured) is elected Post 3 Commander. The post membership for 1924 is 134. From the pages of the Nashua Telegraph, Wednesday, Jan 23, 1924. Department Commander Sullivan Officiates at Induction Ceremony at His Home American Legion Organization. 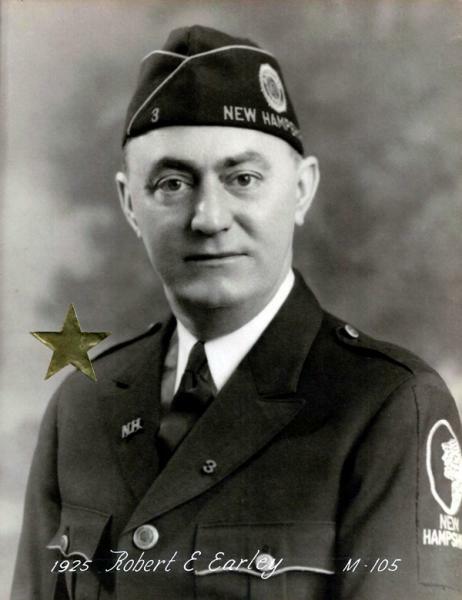 Officers of the James E. Coffey Post, American Legion, and of the Ladies Auxiliary were installed last evening with impressive services at the Legion rooms, with State Commander William E. Sullivan in charge of the.. 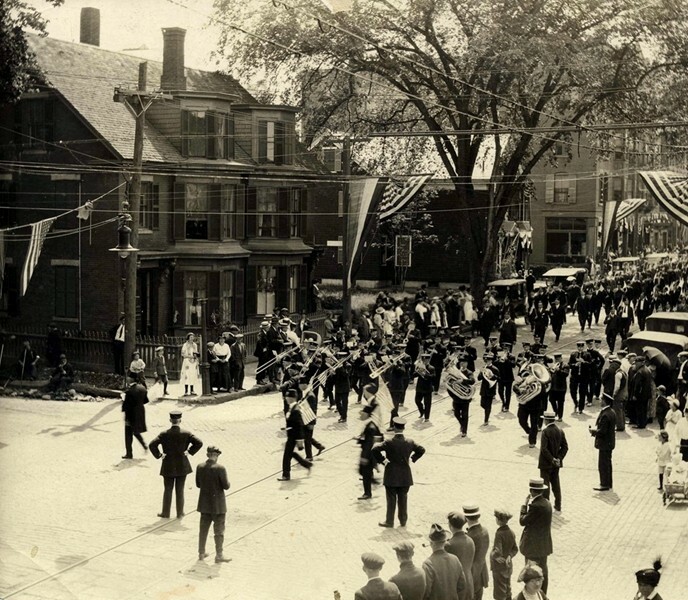 The Nashua Military Band marches in the N.H. Shriners Nobles of Bektash Temple parade on May 27, 1924. AAONMS. They are marching east of East Pearl Street and turning right onto Spring Street. From the pages of the Nashua Telegraph, Jan 7, 1925. "At a largely attended and enthusiastic meeting of the James E. Coffey Post, No.3, American Legion and Ladies Auxiliary, held in Legion hall last evening, the officers of the Post and Unit were installed. The officers of the auxiliary were obligated by Department Vice President Mrs. Irene Walbridge of Peterborough, and the officers of the post were installed by District Vice Commander Wendell Crowell of.. 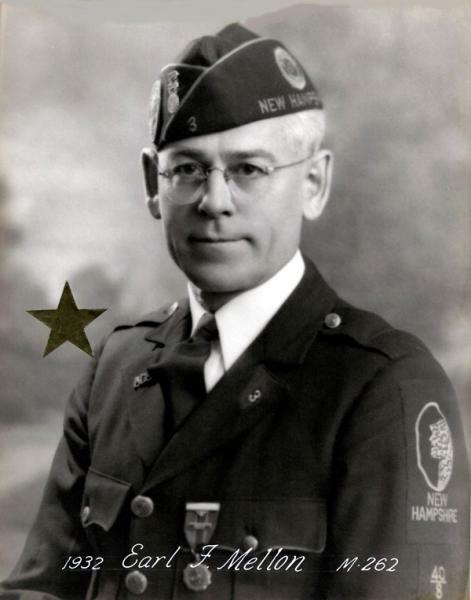 Commander: Earl W. Pratt. 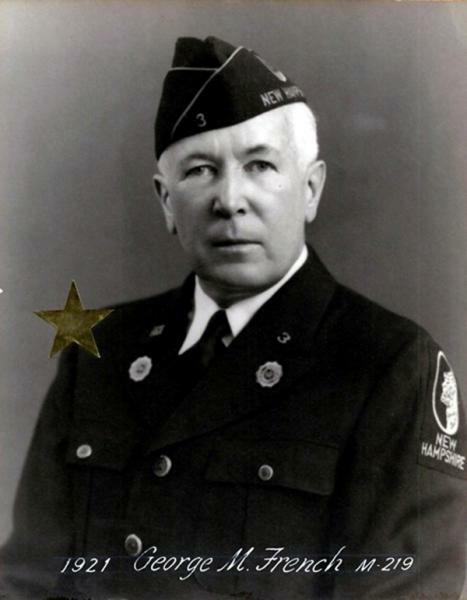 (pictured) Vice Commander: Albert Phippard. Treasurer: Dr. A.E. Brownrigg Finance Officer: George Haggerty Chaplain: Rev. 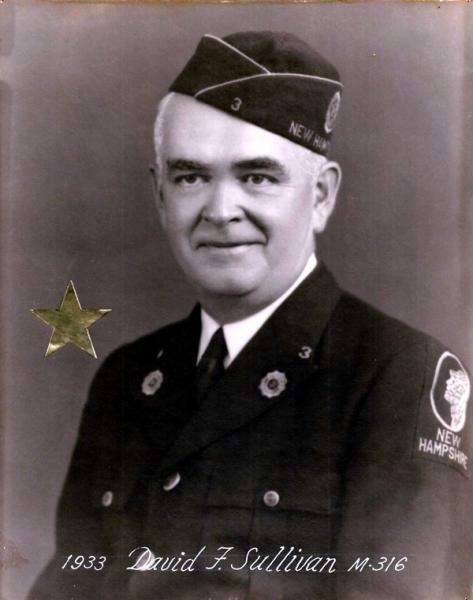 Pierre C. Gamache Historian: David P. Stevens Sergeant At Arms: Arthur O'Neil Commander Earl W. Pratt served two terms as commander of the James E. Coffey post, serving from autumn 1925 to autumn 1927. The American Legion National Convention was held in Paris, France in September 18-27, 1927. Attorney John D. Warren was the only Nashua..
From the pages of the Nashua Telegraph, Wednesday, Nov. 2, 1927. " Officers of the American Legion Post and Auxiliary were installed at G.A.R. hall last evening at a joint meeting which was very largely attended. The meeting was one of the most enthusiastic of the year and following the installation of officers there was an entertainment and lunch. The officers of the American Legion Post were installed by District Vice Commander Richard Welch of.. 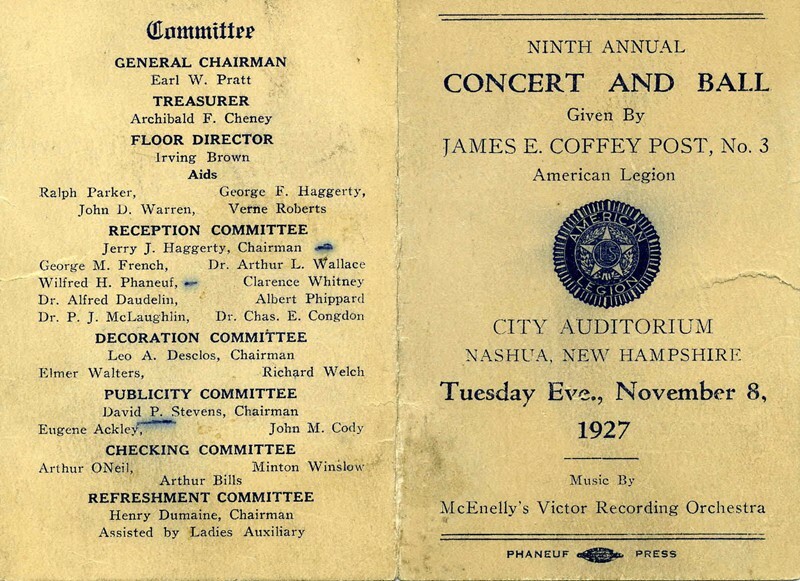 The James E. Coffey Post hosted its ninth annual concert and ball at the Nashua City Auditorium on Tuesday evening, November 8, 1927. Music was provided by McEnelly's Victor Recording Orchestra. The General Chairman for the event was Past Commander Earl W. Pratt. From the minutes of the James E. Coffey Post, Oct 23, 1928. 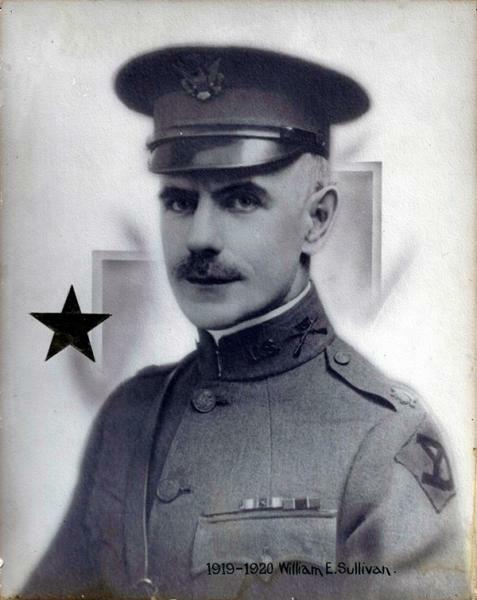 Commander John L. Shea (pictured) was installed as Post Commander for 1928-1929. Installation was held at the Odd Fellows Hall. Installing officer was Andrew Fuegahlsted, District Vice Commander. Officers Installed included: Commander: John L. Shea Vice Commander: Ralph A. Parker Adjutant: Leo A. Desclos Finance Officer: George Haggerty Chaplain: Rev. Earl F. Nauss Historian: George M. French Trustee: Richard F. Welch Sergeant At..
From the minutes of the James E. Coffey Post, Oct 1, 1929. 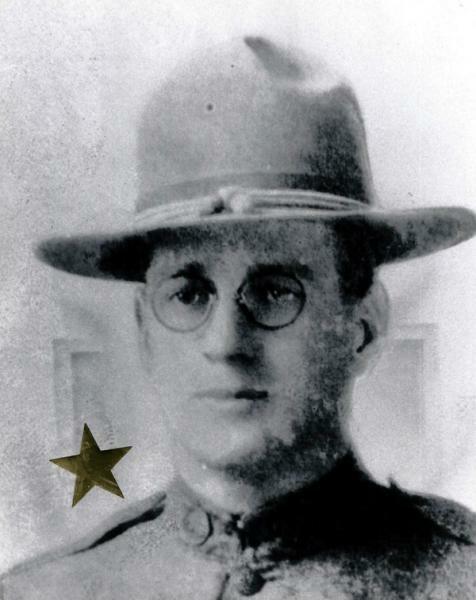 After balloting, the following officers were declared elected for the ensuing year: Commander: Ralph M. Parker (pictured). Vice Commander: Earle L. Williams. 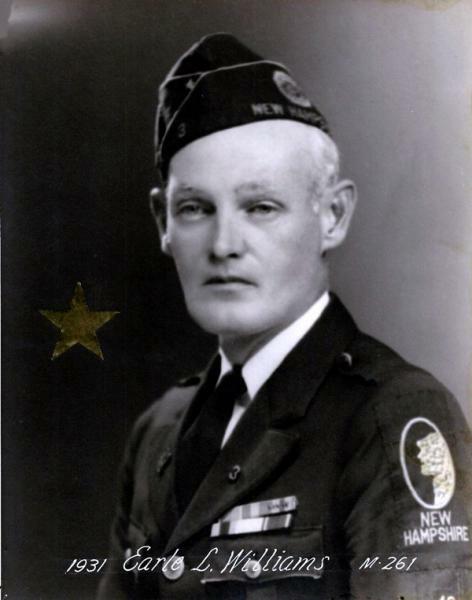 Adjutant: Harold D. Stillman. Finance Officer: William T. Mulligan. Chaplain: Rev. Earl F. Nauss. Historian: George M. French. Sergeant At Arms: Edward Douville. Trustee: John L. Shea. Post membership for 1929-1930: 229. The American Legion National Convention was held in Boston,.. 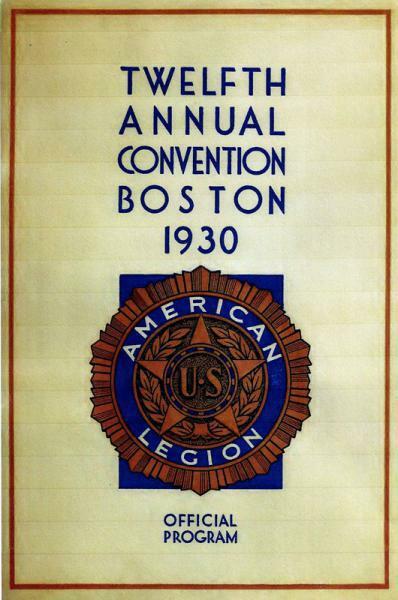 The Twelfth Annual National Convention of the American Legion was held in Boston, MA from 29 Sept. to 9 Oct. 1930. NH delegates to the 12th National Convention in Boston were: Dr. Forrest J. Drury, Londonderry; Frank N. Sawyer, Weare; Maurice F. Devine, Manchester; Clarence F. Worcester, Keene; Clyde Hannant, Greenville; Edward J. Campbell, Exeter; Damis Bouchard, Manchester; Thomas N. Troxell, Concord; George F. Richardson, Lebanon; Clarence Fielden, Franklin; Dr. P. A. Pion, Littleton. From..
From the minutes of the James E. Coffey Post, Oct 6, 1931. As a result of the election of officers, the following were declared elected for the ensuing year: Commander: Earl F. Mellon (pictured). Vice Commander: Arthur S. Johnson. Adjutant: H.J. Ainscow. Finance Officer: William T. Mulligan. Chaplain: Rev. Pierre C. Gamache. Historian: George M. French. Sergeant At Arms: Edward Douville.. Trustee: Earle L. Williams. Post membership for 1931-1932: 262. The official installation took place..
From the pages of the Nashua Telegraph, Wednesday, Oct. 5, 1932. Elections were held at the James E. Coffey Post meeting last evening. The following officers were elected: Commander: David F. Sullivan. Vice Commander: Leo Sirois. Adjutant: Harry J. Ainscow. Finance Officer: William T. Mulligan. Chaplain: Rev. Pierre C. Gamache. Historian: David P. Stevens. Sergeant At Arms: Edward Douville. Membership for 1932-1933: 316 Installation of officers will be held at a special meeting the last..